National University Regular Masters Admissions Release Slip Merit List 2017-2018 Session Online Start and End Date: 25th March 2019 and it continues up to 13th April 2019. If You want to Apply For This Masters Regular Programme Release Slip Then You Have to Visit National University Website nu.edu.bd and Select on Admission Option, After Select, This Admissions Applicant Login Options Then Click On Masters Regular login Tab And Click on APPLY NOW(Masters Regular). Then You Have To Enter Your Honours Or Degree Roll Number, Registrations number, and passing Year and Now You Have to submit this master’s online form. How to Apply For National University Admission Masters Release Slip-2019? The National University of Bangladesh has published National University Masters admission Release Slip Circular Session 2017-2018 post. The National University of Bangladesh is one of the largest Public Versity in Bangladesh. The National University of Bangladesh has published a huge NU Masters Admission Release Slip Result by the www.nu.ac.bd/admissions Authority. 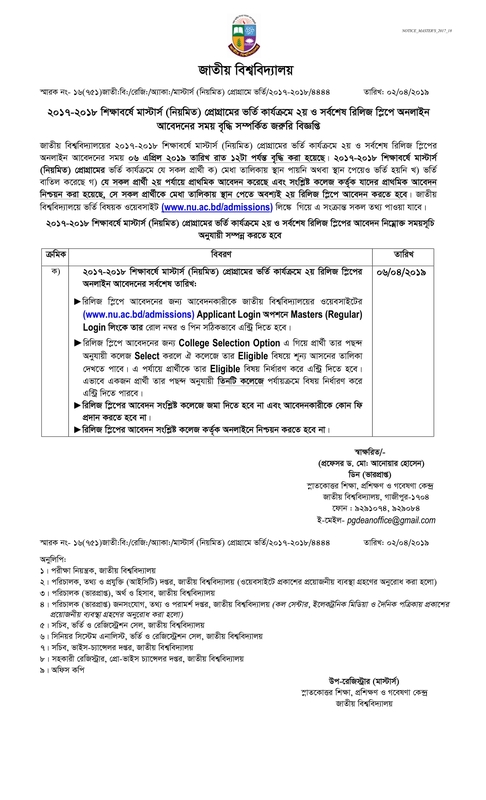 All information regarding the appointment of National University Masters Admission Release Slip is given on our website Educations in bd. We are Publish National University Bangladesh Notice, Result, Form Fill Up Notice, National University Admission Notice, Honours Notice, Degree Notice, Masters Notice, Dhaka University Under 7 College Notice, Result, Form Fill Up Notice, National University Exam routine, Du 7 college Admissions Notice, Exam Results, we published NTRCA Notice Board , Primary School Teacher Job Notice and Question Solution, HSC Exam Notice, SSC Exam Notice ,BCS Notice And Others Educational News, all Jobs Circular Every day, Example Here Government Job in Bangladesh, Bank Job in Bangladesh, Private Job in Bangladesh, Non Government Organization Job also known as NGO Job in Bangladesh, Private Company Job in Bangladesh, Bank Job Results, Government Job Results and all Part-time Job in Bangladesh and other educational support are available here in our Educations in bd website. Nu Masters Admission Release Slip Notice information with also Update some effective information or resource and jobs tips which will help to get the admission easily. We Believe that our distributing News and information will help the activity searchers who are finding Educations Related News Through Online. Our Main target is Online Educations in Bangladesh and Getting Educations Through Online Easily. All the Educations news and jobs news of this Educations in bd website is not for the Students and unemployed people but also employed people too. All type of Educations suggestions, Exam questions solution of different competitive examination is available in Educations in Bd here. We provide all type of educational support on our website Educations in bd. So everyday Stay with our Educations in bd website for all kinds of educations in bd support. Thank You Very much for Visit Our www.educationsinbd.com Website. Always stay with Educations in Bd and Thank you so Much.